Faculty do not need to be Word Press experts or even have proficiency with the platform to require student use. The University ELP Templates are customized for university programs. Online supports guide students in set-up and a Help Site provides students with tutorials. Assisting students in ELP set-up means steering students to the right resource at the right time. Layout the understanding that the ELP is part of the New School learning environment, and although it represents individual voices it is a shared platform that requires consistency. Students may expect to customize the background or logo of a site. They will load the site with all types of individual content to represent their own voice as a researcher, musician, or designer. Guide students to select the program TEMPLATE! Each template was designed specifically for individual New School programs and is made to suit our program needs and community. Have the class work together or in partners to set-up the ELP. Students have diverse experience with technology and can be of great assistance to each other. Require the class to read the template posts before they start using the ELP. Do this in class. If students read these posts carefully and discuss they will have a solid picture of the structure of the learning portfolio and will be able to use it in an organized manner. Model an attitude of adventure. The Campus Press blog is dynamic and exciting, but can take time to build comfort. Allow students to ask questions and help each other. Share the role of expert. Now that your students have ELPs you need to find them to review work. Have your students add their own link to their student profile in canvas. Once this link is added you will be able to view the ELP, as will every faculty who is teaching the student for all subsequent semesters. To get to your students profiles click on the “people” tab in your canvas menu. You will then be able to navigate to the ELP. The tutorial on adding a link a Canvas Profile is here. If your students do not add their own links to canvas profiles, it will be necessary to maintain a list of links to get to student URLs. Set up this list at the beginning of the course and make it available to all students so that they are able to link into each other’s ELPs. Use a system that works with how you already track your class. For example if you use google docs to collect assignments then creating a document and keeping it in the class folder would be an option. Other options include creating a canvas page or a link list on a class blog. Below is an example of a “ELP Assignments” category in Canvas. This helps students manage the ELP assignments. Assignments in Canvas can require the submission of a URL. 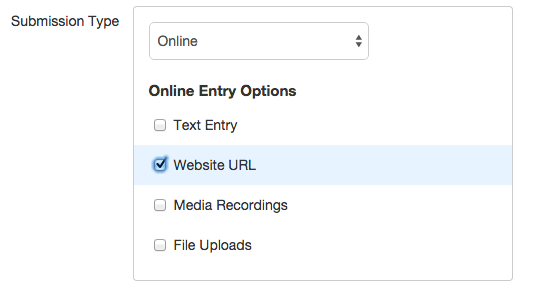 This means that students submit the URL of the assigned ELP post and Canvas takes a screen shot of the ELP at the time of submission. This screen shot can then be viewed in Speed Grader. Note that to view galleries and video it is necessary to link out to the ELP. Want to brush up on Canvas tools and find more advanced uses for Canvas? The ELP is a component of the New School education, however the added content belongs to the student. The student may share the ELP within the New School community or with a larger community outside of the school. In the “reading-settings” section of the student’s dashboard, the student has options to customize privacy. The ideal setting is “visitors must have a login- anyone that is a registered user of the New School Sites can gain access”. This is the suggested setting for students as it makes sharing with students and faculty easy, yet keeps the content within our academic community. “Discourage Search Engines from Indexing This Site” may be a selection that students make when sharing the ELP outside of the New School, to friends, family or employers. Students may shift privacy settings at will. The ELP prepares students for maintaining a professional digital presence. Students may share the ELP with the outside world, but also may prefer to keep the ELP within the New School community. In this situation the student may use the content of the ELP as material to curate into a personal website. Selections of the ELP are also ideal source material to add to student career services Tenlegs profile and portfolio.